Rep. David Sharpe (D-Bristol) leads members of the House Education Committee in a debate over school spending caps. Rep. David Sharpe (D-Bristol), chair of the House Education Committee, started his day Thursday in closed-door meetings with a select few lawmakers working on a deal to fix problems with school-spending caps. Members who had been left out of the loop fumed in the Statehouse hallway. Wright turned out to be correct. By day’s end, Sharpe was apologizing to his committee and conceding the private meetings had failed. “We never did come to a consensus as a group,” he said. That left the Education Committee trying to start over at 5 p.m. Thursday after members heard the governor's budget address, and after many of them had lost the thread of the discussion they've been having the last two weeks. Their goal is to come up with a way to amend the school-spending caps they set last year but that many complain unfairly punish some low-spending school districts. Those on the 11-member panel struggled even to understand each other’s ideas. The Senate voted to repeal the caps entirely, but House members were divided about what to do, even as they conceded time was of the essence. 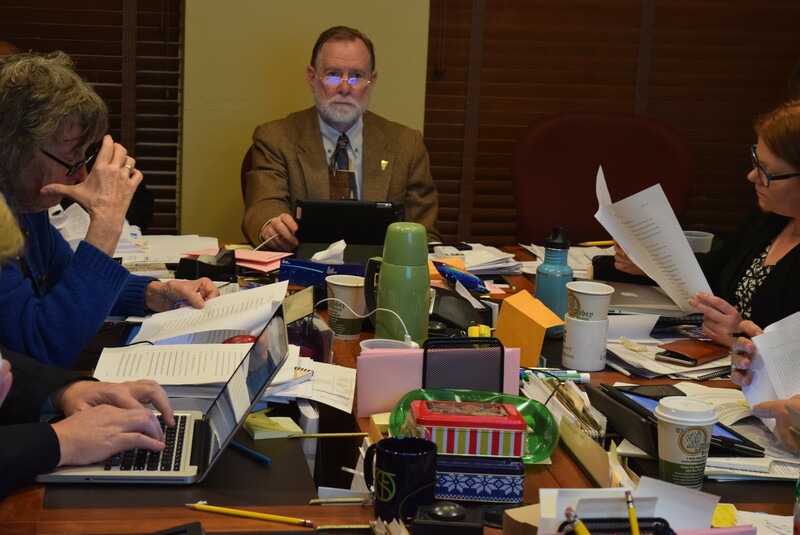 Local school boards need to know how much they can spend before being penalized as they finalize budgets in preparation for March 1 public votes. It appeared Thursday night that the House Education Committee was headed toward raising the caps by 0.9 percent. But they could not agree on when penalties for going over the threshold should kick in. Should higher-spending districts be penalized at a higher rate? Should districts that spend less than the $14,000-per-pupil state average be penalized at all? Should this fix be in place for one year or two? Some of those on the committee and other legislators listening from the sidelines scrambled to work out how each possible solution might affect their towns. Whatever the committee comes up with, Sharpe noted, it’ll need to pass the Ways & Means Committee and the full House before going up against a Senate that is firmly in favor of repealing the caps. He encouraged the committee to focus on a solution that might slip through that gauntlet. But there was one solution from which he was steadfastly trying to steer clear. “I would rather avoid repeal [of the caps],” Sharpe said. With every day that passes, that might be tougher to do. By the time he gave up for the night, it had been a full eight hours since Sharpe had stood in the Statehouse cafeteria, surrounded by reporters questioning how he could justify holding meetings in private. At that time, he calmly defended it as a necessary way to have a candid discussion. By the end of the day, he had a different thought. “This was not my favorite way of moving forward,” he said.